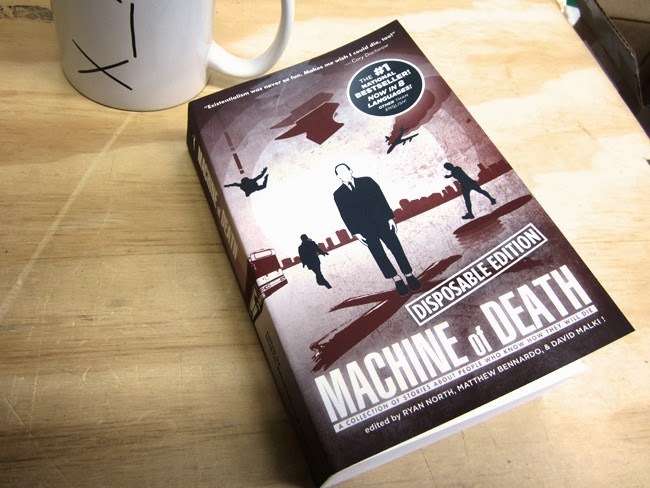 Machine of Death has a fascinating premise, amazing creativity and brings together a diverse group of writers and artists. And that's not even the best part. What really excites me about this book doesn't even involve the content. It's doing things that I've not seen in other commercially produced books. I came by my copy of this book as a reward from the kickstarter for the releated game which I'm really looking forward to playing in the near future. The book was all kicked off by this comic and an open call for story submissions. Some of the authors are recognisable, frequently best known for their online work, others are largely unknown. Each story has an illustration from one of a talented group of authors. The stories revolve around the idea of a 'machine of death' which can, with absolute precision and extreme ambiguity, predict how you will die. Stories predominantly focus on how this might affect our decisions, relationships and society. The variety is incredible and some of the ideas are seriously exciting. I'd recommend reading it for that alone, but there is more to love here. First, applying to all editions of this book with the exception of four specific stories, the book is released under creative commons licencing - while the book has certainly sold plenty of print copies it's perfectly free to copy, email and share with the only real conditions being that the authors are credited and it is not used for commercial gain. You can even download it for free directly from the book's website. For balance, if you wish to buy a paper copy it's sold here. Given all the DRM and library distribution issues plaguing the industry this is a breath of fresh air. I'm not sure it'd be appropriate for all works but for a book of short stories it might just be a great model for quality new authors to get themselves seen and encourage readers to explore their other work. Onto issues that some find upsetting. I believe that no modern mass-produced copy of a book needs to be treated as if it were sacred. Some are shocked to see crafts that chop up books, or to see them removed from library shelves - an issue I've discussed before. This book is clearly labelled as a disposable edition. It's really, really cheap even by paperback standards (regarding Australian pricing at least). At the beginning of the book there is a preface explicitly stating that it's okay if you don't want to keep it but would rather give it away, recycle it or whatever else. Like the Creative Commons licencing I find this incredibly refreshing. The section finishes up with a wonderful line 'This book is not a priceless artifact. Its value lies in the experience of reading it and passing it along. Enjoy! p.s. of course you can keep it if you want to.' So for now I'm going to hang on to my copy - but I'm more than happy to lend it to people wanting to give this book a go. So go, give it a go. Buy it if you wish, or download it for free. Explore fantastic ideas in a work that's exciting for plenty of reasons beyond the brilliant writing.